Cheetahs (Acinonyx jubatus) are found in the eastern and southern Africa savanna, which is comprised mostly of vast grasslands and open woodlands with semi-desert conditions, such as in Namibia and Kenya. Surviving in these adverse arid conditions can be difficult for any animal. Nevertheless, the cheetah has adequately adapted to these conditions, especially when it comes to hunting for food. The cheetah, as a carnivorous animal, must survive by feeding on other animals. Its body features enable it to survive on the few prey in the savanna. It has a long and slim body, muscular legs and a small head, compared to its body, streamlining it to run after prey. Cheetahs can reach a speed of 70 miles per hour and can cover 115 feet in just about two seconds. This makes it the fastest animal on earth. Few of its prey, except perhaps the gazelle, can keep up with this speed. The cheetah has fur that is golden yellow to pale orange in color. This allows the cheetah to camouflage easily in the brown grasslands of the savanna while stalking its prey. Baby cheetah cubs have a mane on their backs, enabling them to blend in with the tall grass in the savanna. Their brown spots also keep them camouflaged while stalking prey. Female cheetahs give birth to two to four cubs only. This makes it easier for the cheetah mother to watch out, manage and protect its cubs from predators. When the cubs grow, the mother roams around in search of a hiding den away from predators until its cubs are old enough to protect themselves. Another adaptation is the "prrps" and "peeps" the cubs make that can be heard over a mile away. Apart from keeping them in touch with each other, the sound reduces the risk of losing their population to predators by scaring them off. The hunting habits of the cheetah have enabled them to survive in the savanna. Cheetahs primarily feed on Thompson gazelle, antelope, hares, ostriches and guinea fowl, all found in the desert. Cheetahs prefer to hunt early in the morning before their prey are prepared for the day or in the evening when their prey are tired. They sometimes hunt in pairs or groups in case they need to bring down a wildebeest or zebra. While hunting, they do not usually ambush their prey. They instead stalk their prey to within 100 yards because, in such instances, their prey will have panicked. The cheetahs will then sprint to attack. The cheetah has very narrow and fully retractable claws that can come out of its paws and go back in whenever it needs to use them. 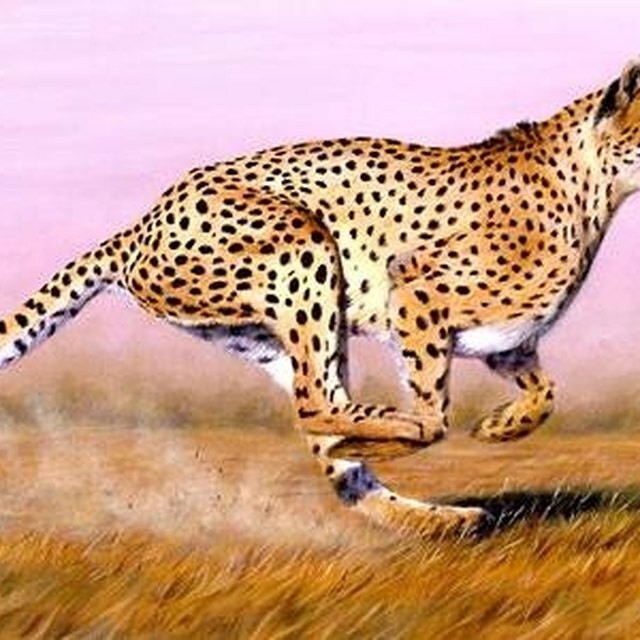 This adaptation is useful for sprinting as the claws dig deep into the earth for better grip while the cheetah runs after its prey. The claws are also slightly curved so that when it catches up with the fleeing prey, the cheetah can easily dig its claws into the hind of the animal, bringing it to the ground. It then grasps the prey’s neck with its strong jaws, causing the animal to suffocate. Zachariah Wavomba started writing professionally in 2007. His articles have appeared in publications such as "Saturday Nation" magazine and "The Standard." Wavomba holds a Master of Arts in international business from the University of Nairobi. Wavomba, Zachariah. "Adaptations of Cheetahs to Live in a Savanna." Sciencing, https://sciencing.com/info-8622954-adaptations-cheetahs-live-savanna.html. 09 January 2018.